I’ve been a little overwhelmed lately, not only with everything we have going on now, but with all the things happening in the next month or so. I’ve been up past midnight every night for as long as I can remember, trying to catch up on work stuff, and this is the first morning I’ve woken up feeling like I am almost there. There are 6 days of work left before I take off the month of June — during which time we have my birthday, Parker’s first birthday and party, my first solo trip since he was born, a baby shower to host, a class to plan, two gigs to play, Zach’s 10-day trip to Brazil for the World Cup, and family vacation in Denver. Holy moly. But this post is called “Lately” so I’ll stop stressing about the future and get back to the present. Parker has continued to grow and change into a little boy in front of our eyes, which is simultaneously awesome and heartbreaking. It seems like every single one of my friends has a new baby, and seeing their photos on Facebook is a further reminder that my baby is so big now. Eating. I have a feeling this is always going to be a bit of a stressful topic for us. Parker is much more open to trying new foods than he was before, but he still doesn’t eat a whole lot. 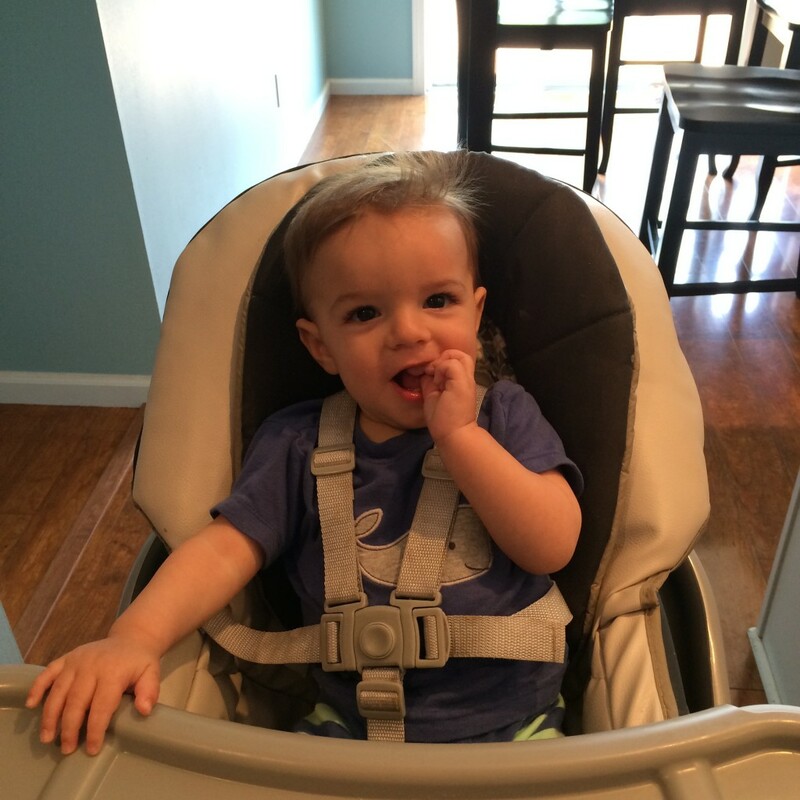 I feel like I pick up way more food off the floor and his high chair than actually makes it into his mouth. He loves cheese, yogurt, crackers, bananas (apparently; he eats them at my in-laws’ house but never with me), Gerber yogurt bites, and to our delight, whole cow’s milk. 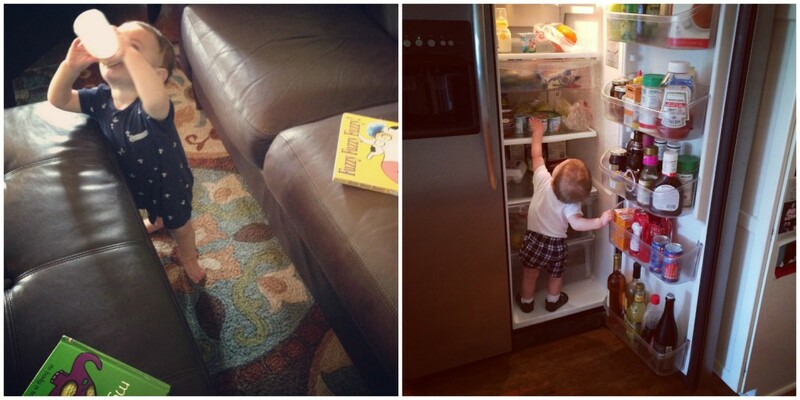 Weaning. Speaking of milk, the transition is going well so far! He is taking his bottle of cow’s milk like a champ, and I am thoroughly enjoying not pumping anymore. I will say that dropping my before-bed session has made for some uncomfortable mornings, but I’m hoping my body adjusts soon. 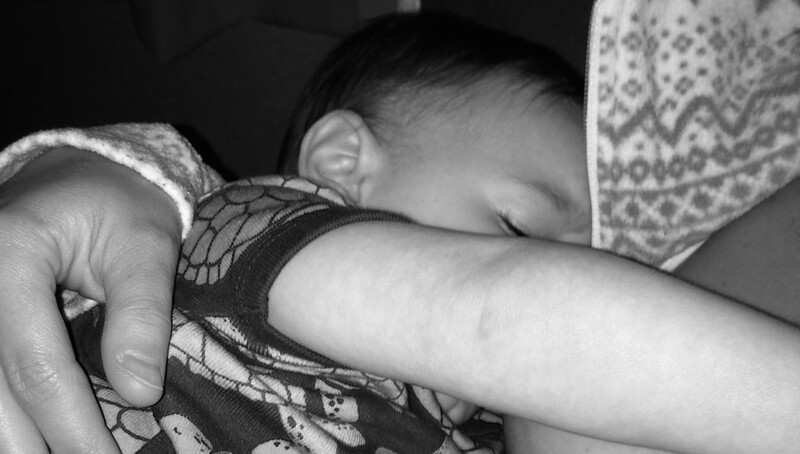 I’m planning to replace another daytime feeding this week and make this shift as gradual as possible, but I really would like to be all done breastfeeding by Parker’s first birthday. If circumstances were different and I wasn’t traveling solo less than a week after, I think I would be okay with going longer…BUT me not being here for a few days will make it easier on both of us (I hope). Teething. Parker was late to this party, getting his bottom two teeth at around 9.5 months. Now he has three top teeth poking through, and it looks like a 4th is on its way. I’m so grateful that the teething symptoms have all but disappeared; they haven’t been nearly as bad as with the first two teeth. Just a short-lived diaper rash and some clinginess/crankiness, which I’ll take any day over FULL WEEKS of awful sleep. Sleeping. And on that note, Parker has become a pretty great sleeper. Who would have thought, considering up until 9 months he rarely slept through the night!? He goes to bed between 7:30-8 every night, and will usually sleep until 6 or 7 without waking up. 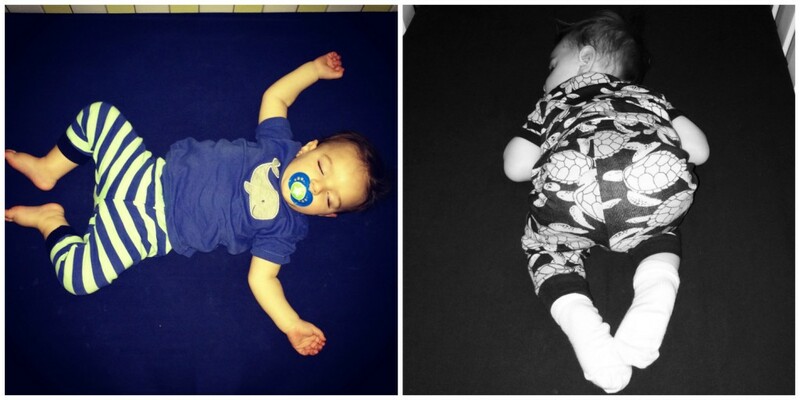 He is also napping better, though the only time he goes down without any struggle at all is right after swim lessons. All the pool time this summer will be wonderful for his sleeping habits! I’ve been singing “Twinkle Twinkle” as I put him down, and then he’ll cry for maybe 5 minutes tops before passing out. I can usually fit in a shower, getting ready, and maybe doing a thing or two around the house before he wakes up. This compared to no naps at all (unless they were on me) just a couple months ago. 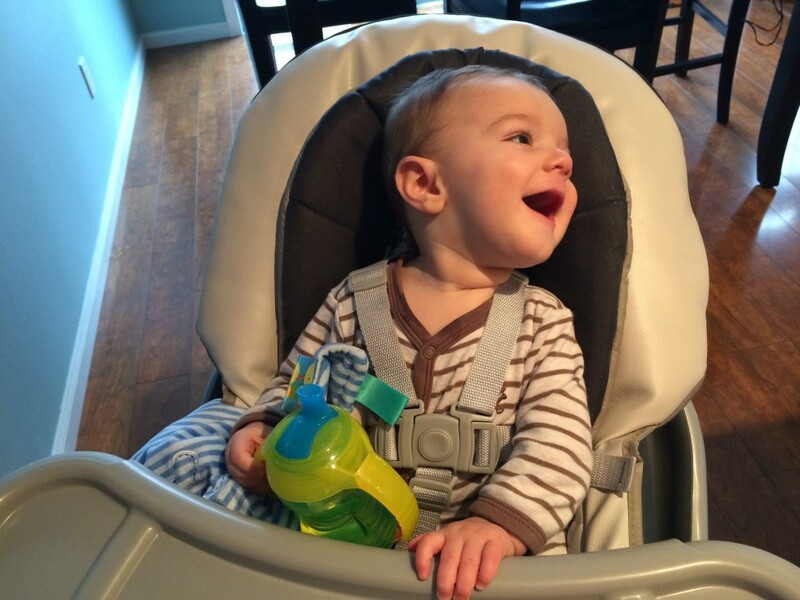 Overall, Parker is a happy boy who is ALWAYS on the move. 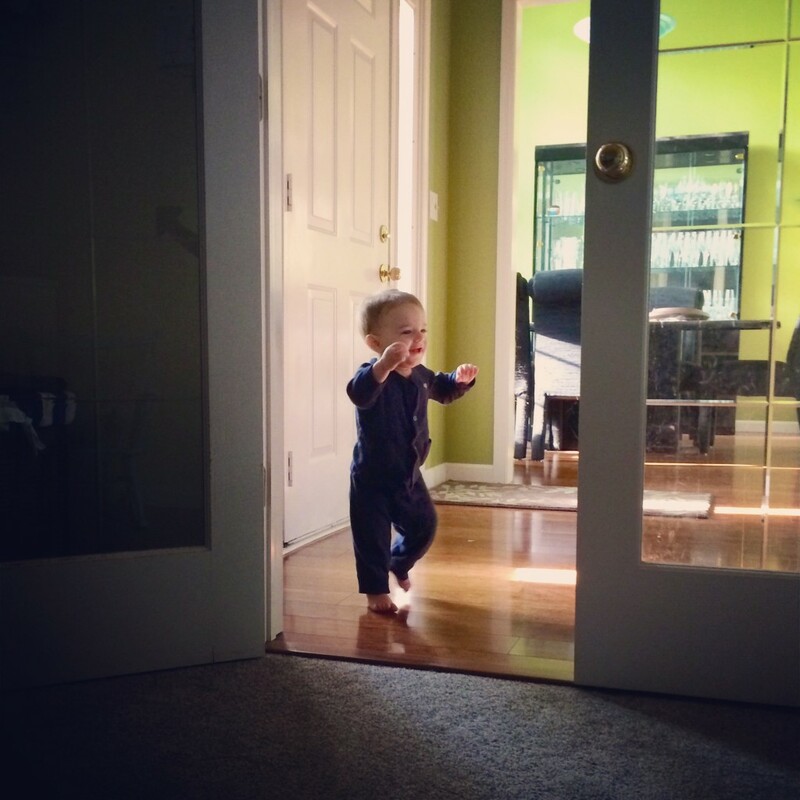 He walks/runs everywhere, and is pretty steady except for when he is super tired. Then he starts stumbling around like he’s had a few too many, and we know it’s time for bed. Parker is also much more comfortable in the water, thanks to his first session of swimming lessons. We are going to LIVE in the pool this summer, starting this weekend! I’ve been yapping on and on about my new digital songbook collection, Spring Into Summer, yet I’ve completely neglected to share the title song here on the blog. I wrote it just off the heels of our final winter snowstorm (I lost count back in January), when spring and summer seemed like a very distant ray of sun in a frozen tundra. I shudder at the memory. I wanted to write a song that covered both seasons, since lots of kiddos consider the end of the school year to be summer — even though it doesn’t technically begin until the end of June. In all honesty, I’m with them! My birthday is on June 5th, and I always think of that as the kickoff to my favorite season. What song(s) do you sing as the seasons change and school comes to an end? And on that topic, can you even believe that there are mere days left until summer break? Just about all of my students have a countdown going, and they are sure to update me every time I see them. Not that they are keeping track or anything! Get immediate access to this, plus over 100 other songs, lead sheets, visual aides, and valuable resources…learn more about becoming a member. You won’t be disappointed! It just doesn’t seem right to be singing about frozen fractals when it’s 80 degrees out. But that didn’t stop the melodious strains of “Let It Go” from flowing out of my fingertips today…multiple times. 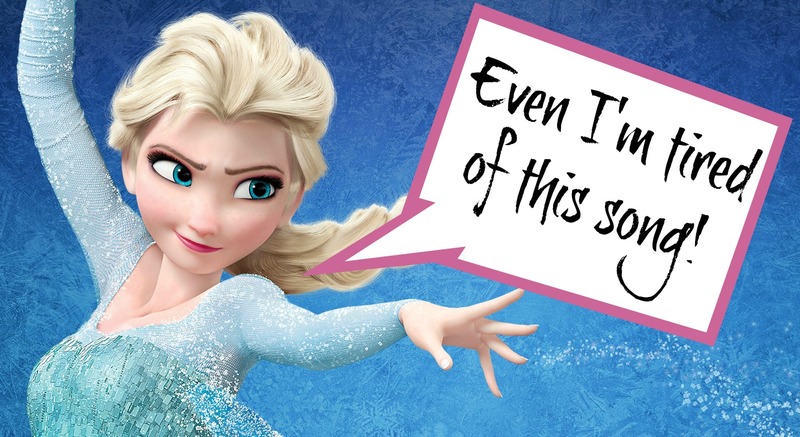 Don’t get me wrong: I love the movie Frozen and just about every song in it. I am thrilled that so many of my students love these songs, too; we’ve enjoyed singing/playing/piggybacking them for the last six months. But I know it’s time to move on when Parker’s babysitters (who are within earshot of my studio) ask how in the world I’m not tired of Frozen music yet. I’m a firm believer in repetition, and I don’t tire of songs very easily. I’m happy to ride the wave of whatever music is most popular with my students at the moment. We’ve been through phases where all we did was Wicked, Adelle, Les Miserables, “Happy” — really, I could go on and on with this list. Frozen, however, will go down in the record books as THE longest phase yet. I’m really proud of my students for our work with these songs in both music therapy and lessons, but I would be lying if I said I wasn’t relieved that I’ll have a break from them (the songs, not my students!) when the spring session ends in a little over a week. Especially “Let It Go”. The one that haunts my dreams at night. This year, for the first time ever, I scheduled a break halfway through my afternoon/evening of work. The picture above illustrates how I’ve spent those 15 minutes every day since September — up until today. This week, my trusty Medela pump is going into storage until my next trip down baby lane. Since Parker will be a year old in just a few weeks, we’re beginning the transition from breastmilk to whole cow’s milk. The bottle he gets while I’m working is the first step in the process, and I’ll gradually be replacing feedings up until his birthday. 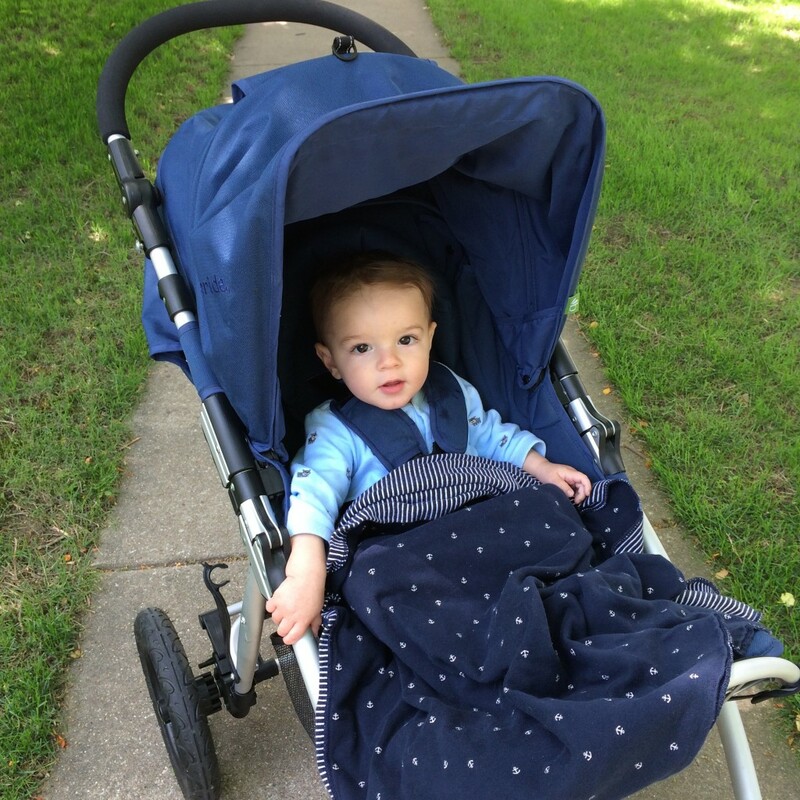 I have been extremely lucky to spend so much time with my son during the first year of his life, which has definitely contributed to our success in breastfeeding. 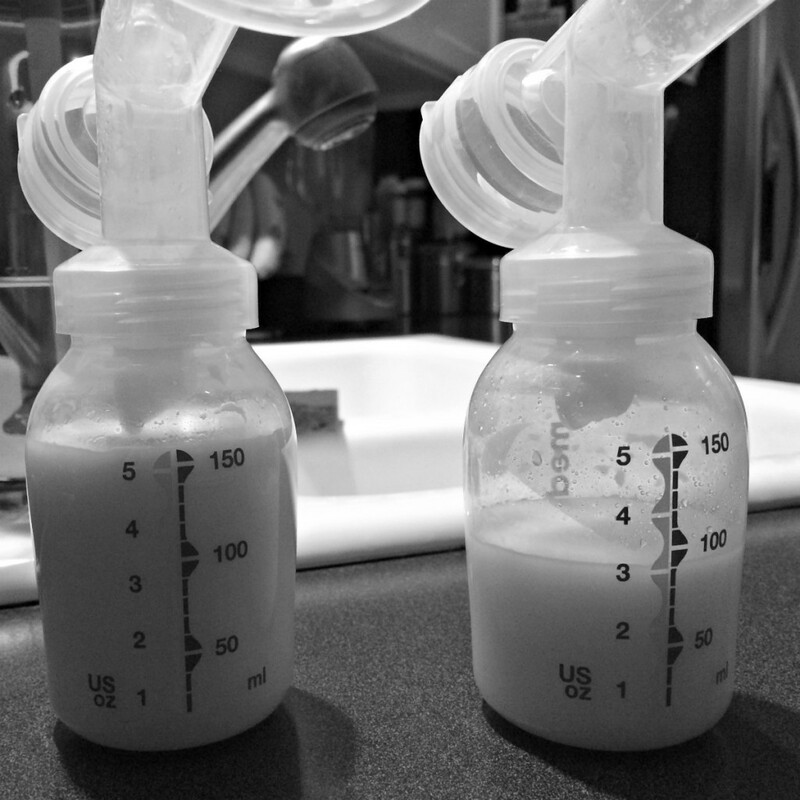 I know that lots of mamas pump multiple times a day at work, and I have an insane amount of respect for them; just once per workday (and then again before I went to bed) was enough for me. Early Childhood Classes are BACK! Last winter, back when my baby was still incubating and I had all the time in the world, I launched an early childhood class based on my Listen & Learn song collection. The class was SO much fun and I loved every second of it, but unfortunately I haven’t had the chance to offer another session…until now. This time around, I’m teaming up with my colleague and fellow music therapist Katey Kratz to offer not one, but TWO classes. I’ll lead the 6-18 month class, and then Katey will lead the 18 month-3 year old class later that morning. Both classes are designed to instill and foster a love of music as well as develop basic skills for both musical growth and daily life. The summer session of Listen & Learn for Little Ones will begin on Tuesday, July 1st and run for five weeks. Each class is 45 minutes in length, and the total cost of the session is $45 (that’s less than $10 per class). Katey and I are super excited about our class location: Capital City Music (formerly Samuel Music) right near my studio on the west side of Springfield. There will be plenty of room for kiddos and their caregivers to spread out, play instruments, and move to the music. The full scoop can be found right here. Or if you’re local to Springfield and ready to register, go for it. It’s going to be an awesome summer filled with two of my very favorite things in the world — music and little ones!